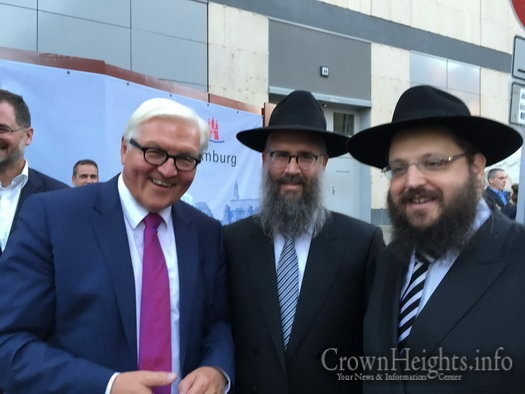 The German Foreign Minister Frank-Walter Steinmeier met last week with the Rabbi of the Jewish community and Chabad Shliach in Berlin, Rabbi Yehuda Teichtal. 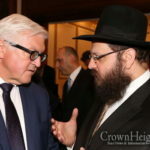 During this meeting, Steinmeier congratulated Rabbi Teichtal on reaching 20 years of rabbinical public service in the capital Berlin, and wished him much success in his future endeavors. 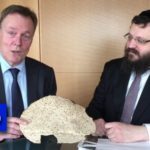 The current meeting between the foreign minister and the rabbi took place alongside the summer events of Hamburg, in the capital Berlin. The meeting was arranged by Steinmeier’s party friends, The Social Democratic Party of Germany (SPD), the second largest party in Germany, after the CDU party which is led by the Chancellor Angela Merkel, and was joined by many politicians and government members from Hamburg and Berlin. The meeting held by these two received much attention in the German media, as there was much media presence at the event. 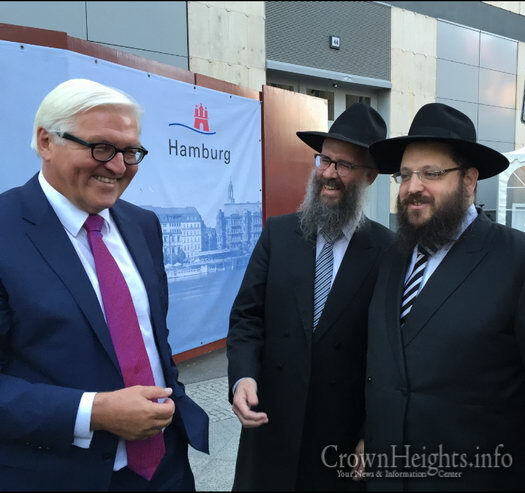 Additional to Steinmeier and Rabbi Teichtal’s presence during the meeting was Rabbi Shlomo Bistritzky, the Rabbi of the Jewish community and the Shliach in Hamburg. Alongside to the meeting with Steinmeier, the two Rabbis met with the Federal Minister of Family Affairs, Manuela Schwesig, and with the Mayor of Hamburg, Olaf Scholz. The meeting held between Rabbi Teichtal and Steinmeier was not the first as the two have kept a close relationship over the past decade and make sure to meet each other from time to time in order to update each other about the Jewish community and discuss further ways the government can assist the community. 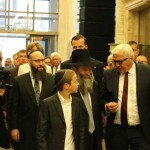 Steinmeier was also the guest of honor during the launching of the Jewish community center in Berlin, which took place seven years ago.